Dark energy, which is driving the accelerating expansion of the universe, is one of the biggest mysteries in physics. It makes up about 68 percent of the total mass and energy of the universe and functions as a sort of antigravity, but we don't yet have a good explanation for it. Simply put, dark energy acts to push matter away from each other, while gravity acts to pull matter together. 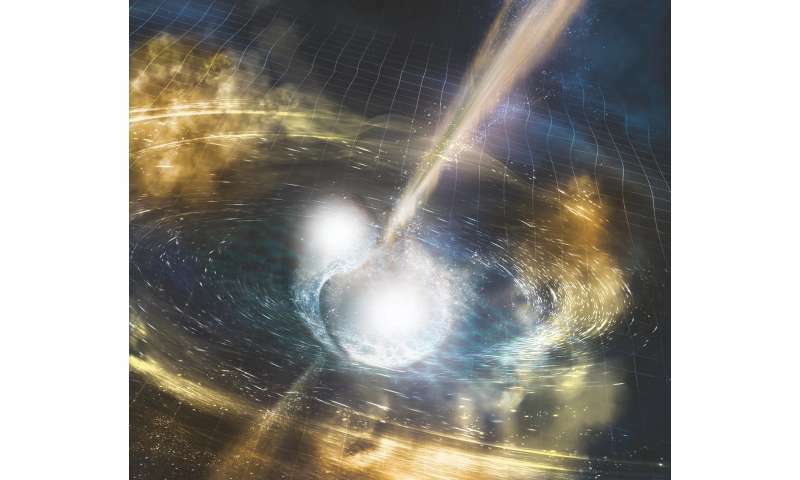 The neutron star merger created gravitational waves - a squiggly distortion in the fabric of space and time, like a tossed stone sending ripples across a pond - that traveled about 130 million light-years through space, and arrived at Earth at almost the same instant as the high-energy light that jetted out from this merger. "Our results make significant progress to elucidate the nature of dark energy," said Miguel Zumalacárregui, a theoretical physicist who is part of the Berkeley Center for Cosmological Physics at the Department of Energy's Lawrence Berkeley National Laboratory (Berkeley Lab) and UC Berkeley. "The simplest theories have survived," he said. "It's really about the timing." A 100-year-old "cosmological constant" theory introduced by Albert Einstein in relation to his work on general relativity and some other theories derived from this model remain as viable contenders because they propose that dark energy is a constant in both space and time: Gravitational waves and light waves are affected in the same way by dark energy, and thus travel at the same rate through space. "The favorite explanation is this cosmological constant," he said. "That's as simple as it's going to get." There are some complicated and exotic theories that also hold up to the test presented by the star-merger measurements. Massive gravity, for example - a theory of gravity that assigns a mass to a hypothetical elementary particle called a graviton - still holds a sliver of possibility if the graviton has a very slight mass. Some other theories, though, which held that the arrival of gravitational waves would be separated in time from the arriving light signature of the star merger by far longer periods - stretching up to millions of years - don't explain what was seen, and must be modified or scrapped. 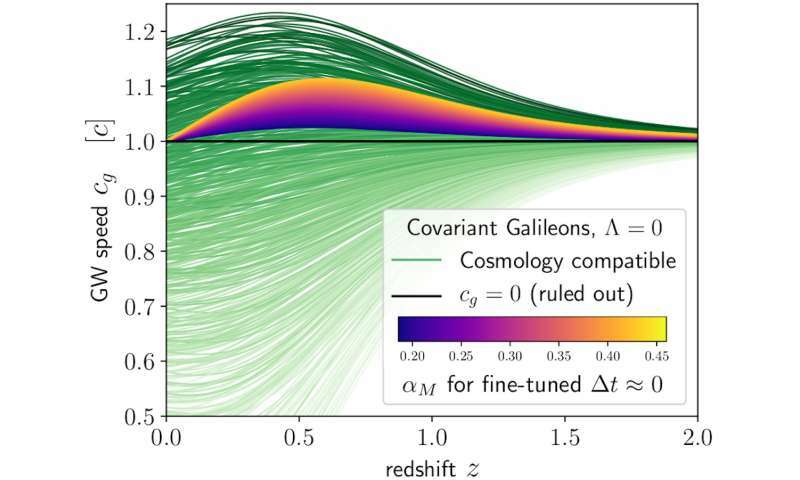 With tweaks, some of the challenged models can survive the latest test by the star merger, Zumalacárregui said, though they "lose some of their simplicity" in the process. But those types of events do not produce an associated burst of light. "You need both - not just gravitational waves to help test theories of gravity and dark energy," Zumalacárregui said. Another implication for this field of research is that, by collecting gravitational waves from these and possibly other cosmological events, it may be possible to use their characteristic signatures as "standard sirens" for measuring the universe's expansion rate. This is analogous to how researchers use the similar light signatures for objects - including a type of exploding stars known as Type Ia supernovae and pulsating stars known as cepheids - as "standard candles" to gauge their distance. Gathering more data from events that generate both gravitational waves and light could also help resolve different measurements of the Hubble constant - a popular gauge of the universe's expansion rate. "Gravitational waves are a very independent confirmation or refutation of the distance ladder measurements," he said. "I'm really excited for the coming years. At least some of these nonstandard dark energy models could explain this Hubble rate discrepancy. "Maybe we have underestimated some events, or something is unaccounted for that we'll need to revise the standard cosmology of the universe," he added. "If this standard holds, we will need radically new theoretical ideas that are difficult to verify experimentally, like multiple universes - the multiverse. However, if this standard fails, we will have more experimental avenues to test those ideas." New instruments and sky surveys are coming online that also aim to improve our understanding of dark energy, including the Berkeley Lab-led Dark Energy Spectroscopic Instrument project that is scheduled to begin operating in 2019. And scientists studying other phenomena, such as optical illusions in space caused by gravitational lensing - a gravity-induced effect that causes light from distant objects to bend and distort around closer objects - will also be useful in making more precise measurements. "It could change the way we think about our universe and our place in it," Zumalacárregui said. "It's going to require new ideas." It is true that they can't be 100% sure they are the same event with only two gravitational wave detectors. They need a third to pinpoint an exact origin. Cosmology could really benefit from AI algorithms like alpha zero. There are so many variables and theories that it is far easier for a computer to run all the possibilities rather than us humans. We just need to continue recording data until our hardware and software are sophisticated enough. One of the issues is that there could be multiple theories that are correct and/or we haven't even come up with the correct one yet. Cosmology is really a mess right now with the whole DM DE thing. It's not like there is a small discrepancy between what our model predicts and what we observed, these are huge differences. It will be interesting to find out how they finally resolve it. May take a whole new theory like when Einstein came around with relatively. It seems that science takes one step forward and .99 steps backward in regard to solving the mystery surrounding DE. We seem to be back to where we started.